Waiting for a car to be repaired can be long and boring, but one Arlington man's wait became exciting when he won $2.5 million Wednesday. While his car was in the shop, John Johns walked to the 7-Eleven at 7333 Richmond Highway in Alexandria for a cup of coffee. He decided to buy a few Virginia Lottery scratch tickets while he was there, and that’s when he won the top prize in the $2,500,000 Cash Winfall game. 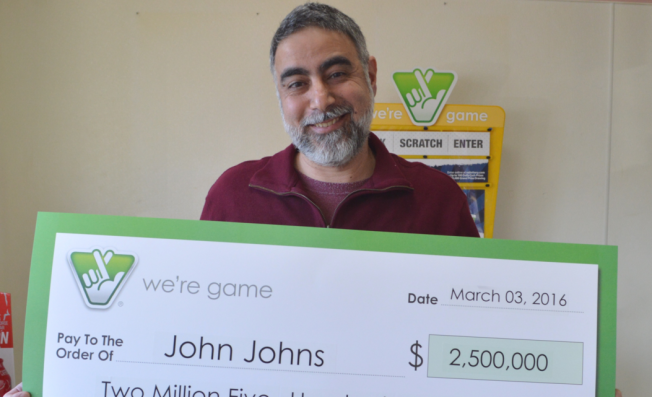 Johns returned to the 7-Eleven Thursday to claim his check from the Virginia Lottery. He had the choice of taking the full $2.5 million in annual payments over 30 years or a one-time cash option of $1,351,351 before taxes. He chose the cash option, according to the Virginia Lottery. The 7-Eleven will also receive a $10,000 bonus for selling the ticket. The scratch-off game features prizes ranging from $20 to $2.5 million. Johns claimed the first top prize, and two more have yet to be claimed. Johns has no immediate plans for his winnings but said that there may be a vacation in his future.